Carlow (; Irish: Ceatharlach) is the county town of County Carlow, Ireland, in the south-east of Ireland, 84 km from Dublin. At the 2016 census, it had a combined urban and rural population of 24,272. The county of Carlow has a population of 56,932. The River Barrow flows through the town, and forms the historic boundary between counties Laois and Carlow: The Local Government (Ireland) Act 1898 included the town entirely in County Carlow. The settlement of Carlow is thousands of years old and pre-dates written Irish history. The town has played a major role in Irish history, serving as the capital of the country in the 14th century. The name is an anglicisation of the Irish Ceatharlach. Historically, it was anglicised as Caherlagh, Caterlagh and Catherlagh, which are closer to the Irish spelling. According to logainm.ie, the first part of the name derives from the Old Irish word cethrae ("animals, cattle, herds, flocks"), which is related to ceathar ("four") and therefore signified "four-legged". The second part of the name is the ending -lach. Some believe that the name should be Ceatharloch (meaning "quadruple lake"), since ceathar means "four" and loch means "lake". It is directly translated as "Four lakes", although, there is seemingly no evidence to suggest that these lakes ever existed in this area. The Carlow county area has been settled for thousands of years, evidence of human occupation extends back thousands of years, the most notable and dramatic prehistoric site being the Browneshill Dolmen – a megalithic portal tomb just outside Carlow town. Now part of the diocese of Kildare and Leighlin, several Early Christian settlements are still in evidence today around the county. 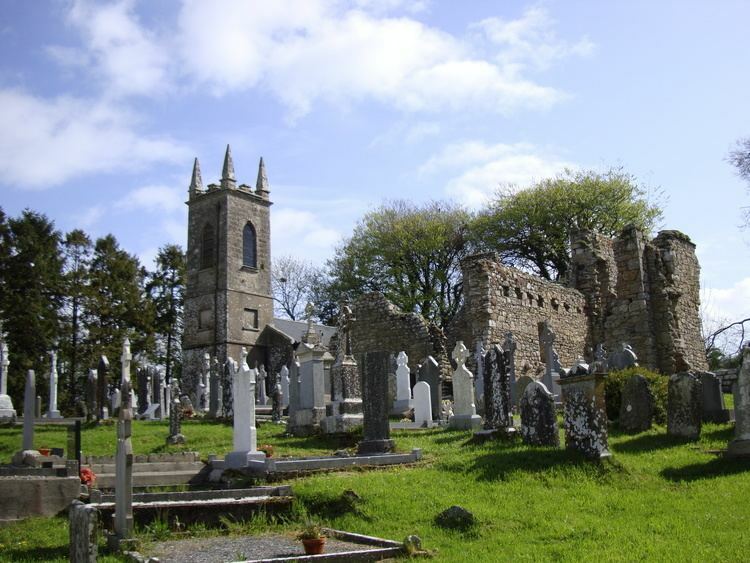 St Mullin's monastery is believed to have been established around the 7th century, the ruins of which are still in evidence today. Old Leighlin was the site of one of the largest monastic settlements in Ireland and the location for a church synod in 630 AD which determined the date of Easter. St Comhgall built a monastery in the Carlow area in the 6th century, an old church building and burial ground survive today at Castle Hill known as Mary's Abbey. Carlow was an Irish stronghold for agriculture in the early 1800s which earned the county the nickname of the scallion eaters. Famine wiped out a lot of the population, cutting it in half. Carlow Castle was constructed by William Marshal, Earl of Striguil and Lord of Leinster, c1207-13, to guard the vital river crossing. It was also to serve as the capital of the Lordship of Ireland from 1361 until 1374. This imposing structure survived largely intact until 1814 when it was mostly destroyed in an attempt to turn the building into a lunatic asylum. The present remains now are the West Wall with two of its cylindrical towers. The bridge over the river Barrow – Graiguecullen Bridge, is agreed to date to 1569. The original structure was largely replaced and widened in 1815 when it was named Wellington Bridge in celebration of the defeat of Napoleon's army by the Duke of Wellington at the Battle of Waterloo in June of that year. The bridge was built across a small island in the river and a 19th-century house was constructed on the bridge – this was for a time occupied by the Poor Clares, an enclosed religious order who still have a convent in Graiguecullen. Another convent belonging to the Presentation Order of nuns now houses the County Library and beautifully restored, newly opened Carlow County Museum. The Cathedral, designed by Thomas Cobden, was the first Catholic cathedral to be built in Ireland after Catholic Emancipation in 1829. Its construction cost £9,000 and was completed in 1833. Beside the cathedral, Saint Patrick's College dates from 1793. The College, was established in 1782 to teach the humanities to both lay students and those studying for the priesthood. The Carlow Courthouse was constructed in the 19th century. There are still many old estates and houses in the surrounding areas, among them Ducketts Grove and Dunleckney Manor. St Mullin's today houses a heritage centre. In 1703 the Irish House of Commons appointed a committee to bring in a bill to make the Barrow navigable, by 1800 the Barrow Track was completed between St. Mullin's and Athy, establishing a link to the Grand Canal which runs between Dublin and the Shannon. By 1845 88,000 tons of goods were being transported on the Barrow Navigation. Carlow was also one of the earliest towns to be connected by train, the Great Southern and Western Railway had opened its mainline as far as Carlow in 1846, this was extended further to reach Cork in 1849. The chief engineer, William Dargan, originally hailed from Killeshin, just outside Carlow. At the peak of railway transport Ireland, Carlow county was also served by a railway line to Tullow. Public supply of electricity in Carlow was first provided from Milford Mills, approximately 8 km south of Carlow, in 1891. Milford Mills still generates electricity feeding into the national grid. Following independence in the early 1920s the new government of the Irish Free State decided to establish a sugar-processing plant in Leinster, Carlow was settled on as the location due to its transport links and large agricultural hinterland, favourable for growing sugar beet. The town is recalled in the famous Irish folk song, Follow Me Up to Carlow, written in the 19th century about the Battle of Glenmalure, part of the Desmond Rebellions of the late 16th century. In 1650, during the Cromwellian conquest of Ireland, Carlow was besieged and taken by English Parliamentarian forces, hastening the end of the Siege of Waterford and the capitulation of that city. During the 1798 rebellion Carlow was the scene of a massacre of 600 rebels and civilians following an unsuccessful attack on the town by the United Irishmen, known as the Battle of Carlow. The Liberty Tree sculpture in Carlow, designed by John Behan, commemorates the events of 1798. The rebels slain in Carlow town are buried in the 'Croppies Grave', in '98 Street, Graiguecullen. The Carlow Nationalist is a newspaper which was established in 1883. One of Carlow's most notable landmarks is the Brownshill Dolmen, situated on the Hacketstown Road (R726). The capstone of this impressive Dolmen is reputed to be the largest in Europe. Carlow Castle was probably built between 1207 and 1213 by William Marshall on the site of a motte erected by Hugh de Lacy in the 1180s. Only the western wall and two towers now survive. It is located on the banks of the River Barrow near Carlow town centre. The castle is now the imposing centrepiece of a major urban renewal programme. Ducketts Grove is the ruin's of the Georgian home of the Duckett Family, built circa 1800s. It was taken over by Carlow County Council in 2005, who restored the walled gardens for use by the public as a park. It is situated just off the R418. Carlow Courthouse is situated at the end of Dublin Street. It was designed by William Vitruvius Morrison in 1830 and completed in 1834. It is built of Carlow granite and gives the impression of being a temple set on a high plinth. The basement contains cells and dungeons. A cannon from the Crimean War stands on the steps. Carlow Town Hall is situated on the north side of the Haymarket, and was the trading centre for Carlow. A number of other markets were located around the town, including the Potato Market and Butter Market. The Town Hall was designed by the church architect William Hague in 1884. Milford is a green area on the River Barrow approx 5 miles outside of Carlow town. It is notable as its home to Milford Mill, which was the first inland hydro-electrical plant in Ireland. It began supplying Carlow town with power in 1891. The estate at Oak Park is located 3 kilometres (1.9 mi) north of Carlow. Carlow industry has come a long way since the early 20th century, when the town became the centre of Ireland's slow process of industrialisation with the creation of the Irish Sugar Company – then the cutting edge of industry in Ireland, the sugar factory opened in 1926 as a private enterprise and was eventually nationalised before reverting to private ownership. The sugar factory was closed on 11 March 2005 as the management of the parent company Greencore decided that it was no longer economical to run the factory nor was it viable to upgrade the facility. The country's last remaining plant at Mallow, County Cork closed in 2006. One of the traditional, principal employers in Carlow was OralB Braun, which had a large factory producing mostly hair dryers and electric toothbrushes, however this closed in 2010. Burnside is also a principal employer in the area which produces hydraulic cylinders. The Institute of Technology is also a significant employer in the town. Since opening its doors in October 2003 Fairgreen Shopping Centre has also played a large part in employment in the area, with Tesco, Heatons, Next, New Look and River Island being the main tenants of the shopping centre. Nonetheless, the town shares problems associated with other provincial towns in Ireland – the inability to attract significant new industry. Pharmaceutical giant Merck & Co. intends to build a new vaccine manufacturing plant in Carlow. The N9 road from Dublin to Waterford passed directly through the town until May 2008 when a bypass, part of the M9 motorway, was opened, greatly reducing traffic through the town. The N80 National secondary road skirts the edge of the town. The town is also connected to the national rail network. These transport links have helped Carlow to become a successful satellite town of Dublin in recent years. The establishment of the Institute of Technology, Carlow, has also helped drive growth in the area and encouraged many school leavers to remain in the town. Carlow railway station opened on 4 August 1846 and was closed for goods traffic on 9 June 1976, it remains open for public travel. St. Patrick's, Carlow College opened in 1793 and was the first post-penal Catholic seminary constructed in Ireland. It is built in the form of a large country house and claims to be the seminary in longest continuous use worldwide. It trained many priests who served in distant countries such as Australia. Carlow Cathedral dedicated to Our Lady of Assumption, was started in 1828 and completed in 1833, in Gothic style. The main architect was Thomas Cobden, but the cathedral was the brain-child of the Bishop of Kildare and Leighlin, James Doyle (J.K.L. ), a prominent champion of Catholic Emancipation, who died the year after the cathedral was opened and is interred in its walls. A sculpture, by John Hogan, in memorial to the bishop was finished in 1839. An unidentified baby was left here on 22 January 2010. St. Mary's Church of Ireland dates from 1727, though the tower and spire, built to a height of 59 m (195 ft) were added in 1834. The interior retains its traditional galleries and there are several monuments, including some by neo-classical architect, Sir Richard Morrison. On Thursday, 2 July 1903 the Gordon Bennett Cup ran through Carlow. It was the first international motor race to be held in the United Kingdom of Great Britain and Ireland, an honorific to Selwyn Edge who had won the 1902 event in Paris driving a Napier. The Automobile Club of Great Britain and Ireland wanted the race to be hosted in the British Isles, and their secretary, Claude Johnson, suggested Ireland as the venue because racing was illegal on British public roads. The editor of the Dublin Motor News, Richard J. Mecredy, suggested an area in County Kildare, and letters were sent to 102 Irish MPs, 90 Irish peers, 300 newspapers, 34 chairmen of county and local councils, 34 County secretaries, 26 mayors, 41 railway companies, 460 hoteliers, 13 PPs, plus the Bishop of Kildare and Leighlin, Patrick Foley, who pronounced himself in favour. Local laws had to be adjusted, ergo the 'Light Locomotives (Ireland) Bill' was passed on 27 March 1903. Kildare and other local councils drew attention to their areas, whilst Queen's County declared That every facility will be given and the roads placed at the disposal of motorists during the proposed race. Eventually Kildare was chosen, partly on the grounds that the straightness of the roads would be a safety benefit. As a compliment to Ireland the British team chose to race in Shamrock green which thus became known as British racing green, although the winning Napier of 1902 had been painted Olive green. The route consisted of two loops that comprised a figure of eight, the first was a 52-mile loop that included Kilcullen, The Curragh, Kildare, Monasterevin, Stradbally, Athy, followed by a 40-mile loop through Castledermot, Carlow, and Athy again. The race started at the Ballyshannon cross-roads (53.0853°N 6.82°W﻿ / 53.0853; -6.82) near Calverstown on the contemporary N78 heading north, then followed the N9 north; the N7 west; the N80 south; the N78 north again; the N9 south; the N80 north; the N78 north again. Competitors were started at seven-minute intervals and had to follow bicycles through the 'control zones' in each town. The 328 miles (528 km) race was won by the famous Belgian Camille Jenatzy, driving a Mercedes in German colours. The Carlow Racquetball club was set up in 1978. The club is one of only 7 in the south eastern region and is the largest of these. Carlow Jaguar Scooter Club founded 1979, one of the longest running scooter clubs in Ireland or England.